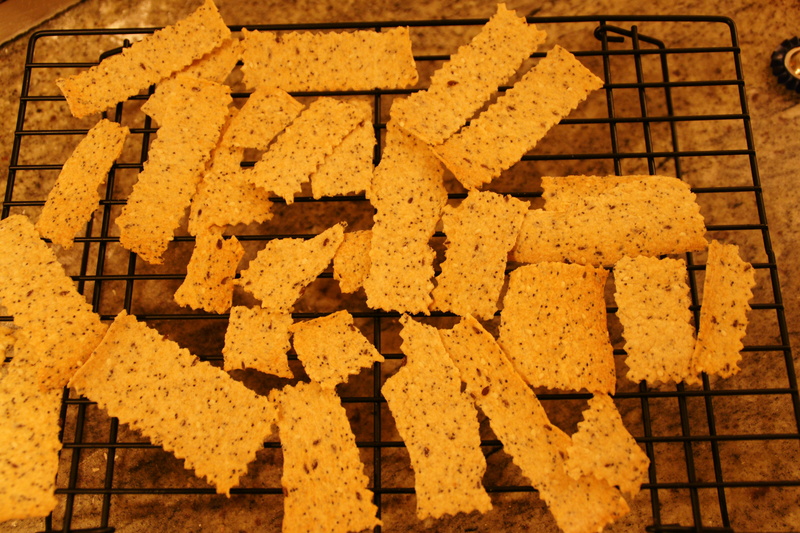 Our July 2012 Daring Bakers’ Host was Dana McFarland and she challenged us to make homemade crackers! Dana showed us some techniques for making crackers and encouraged to use our creativity to make each cracker our own by using ingredients we love. 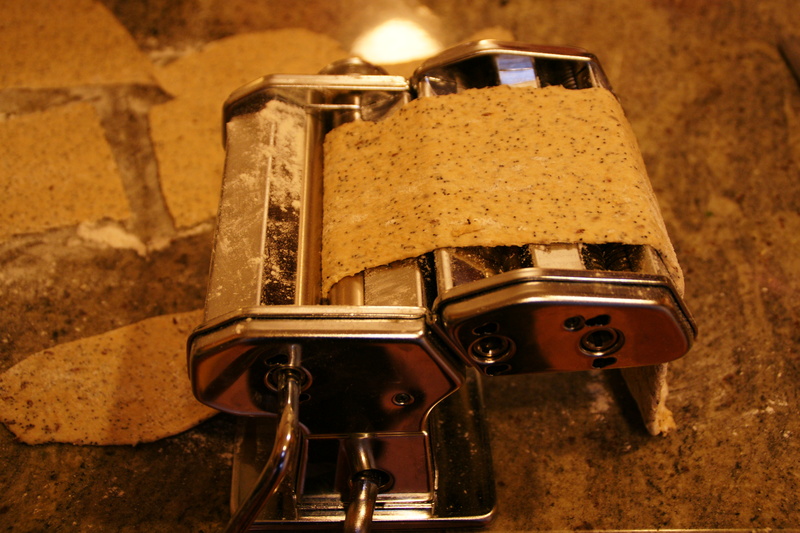 The challenge required us to make crackers using two different methods of forming – hand rolling, pasta rollers or a combination of the two being the main choices. It’s been a pretty testing month at work and I have been turning to frivolous baking for escapism. So I was initially slightly disappointed when I found out that this month’s challenge was crackers. What, no excessive amounts of fat and sugar?! Then I realised it was a chance to make something that I would actually like to eat. So yay for crackers! I hadn’t realised, but apparently kale is the latest Miranda Kerr of the vegetable world. It’s the hipster vegetable of choice. 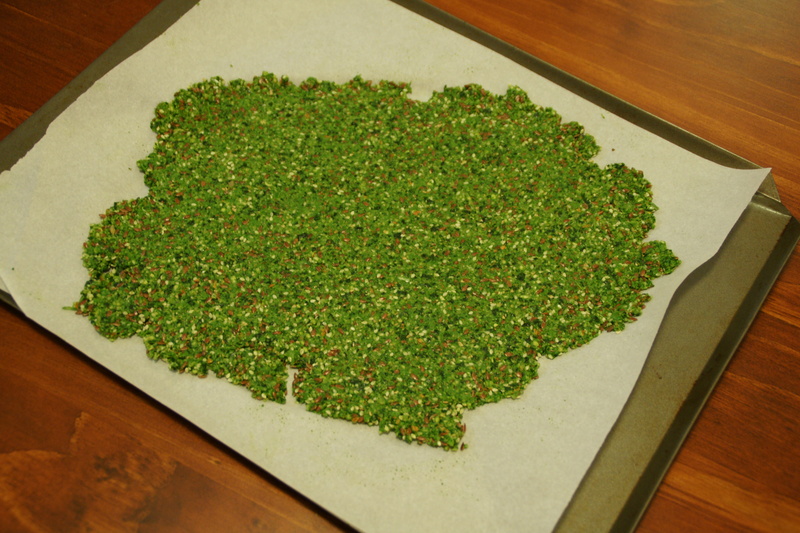 I had been reading about kale chips, where you put some olive oil and salt on kale leaves, bake them until they are crispy then break them up into chips (crisps). I was curious but unconvinced. I ground the kale in the Thermoix then chucked everything else in and whizzed it for bit. I then scooped it all out onto a baking tray covered with baking paper, covered the mixture with some cling film and flattened it out with a rolling pin. The smell and colour were just sensational. I realise it’s imprecise, but I think I baked them for about 30 minutes at about 180 – 200 degrees. 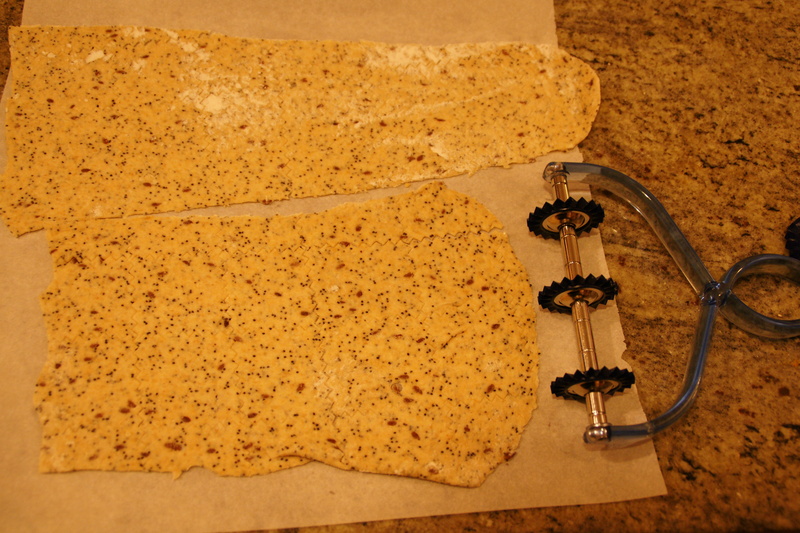 By that time the thinner edge bits were getting crispy so I cut them off and put the rest back in the oven to crisp up. And they were delicious! A revelation. I’ve already made them twice and have a big bunch of kale waiting to be crackerised tomorrow. It’s almost enough to turn me vego again. The water bit was a mistake – it made it too sloppy and I had to add more flour to pull it back. So if you are trying to recreate this, use less water. I kneaded it for a bit (ie pressed the knead function on the Thermoix for around a minute) and then let it rest for about half an hour. I then put it through the pasta roller. On my first attempt I accidentally put it through the finest grade rather than the most coarse, but picked up my mistake pretty quickly. I was happy with the result – they were quick, healthy and tasty and I knew exactly what went into them. 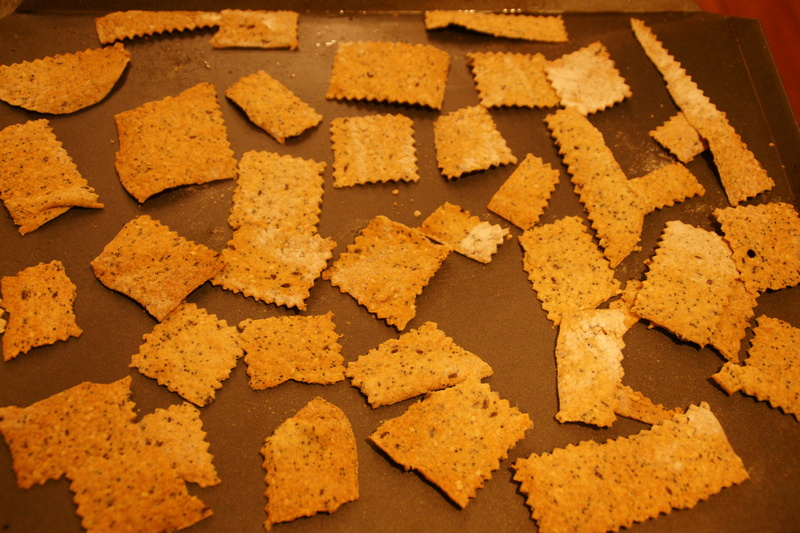 The husband commented that they were better than commercial crackers and that they tasted more wholesome. I can’t really ask for more that. 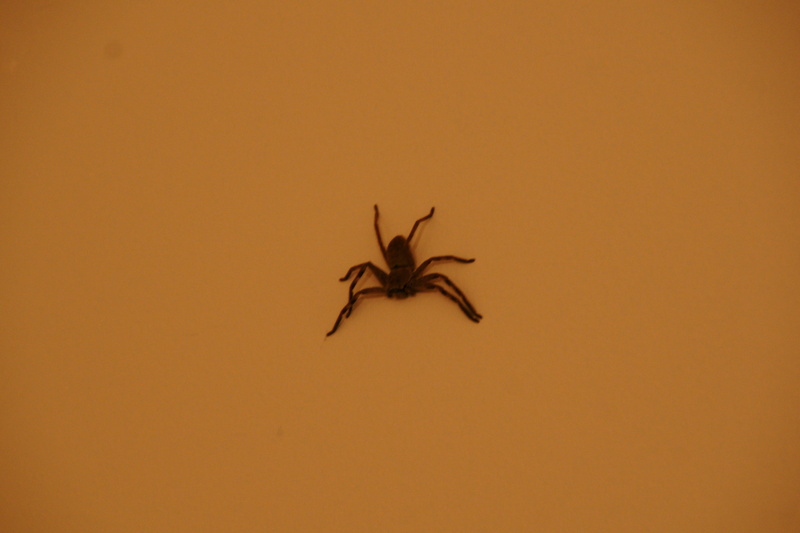 And finally, apropos of nothing, here is a picture of the little fella who has been keeping me company on the wall while I type this. Apparently (at least according to Miss B), his name is Jamie. Eek about Jamie! 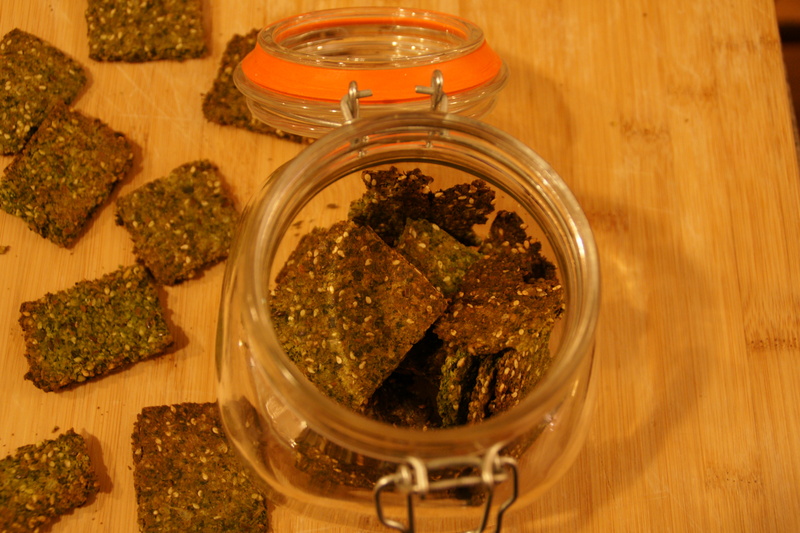 I’m glad you made kale crackers because I’ve always been curious about those. Wonder what else other than kale can also be used! The crackers look sensational. And the green colour in the raw dough is gorgeous!